The college is well equipped with LCD along with a computer installed in the Lecture Hall for use by the staff and students. The college also has Overhead Projectors, Audio Equipment, a VCD Player and Television, and other equipments which are often used in the teaching-learning process. The college has a newly-renovated state-of-the-art computer laboratory with Internet connection facilities. The laboratory has personal computers with the latest configurations especially for the use by the students. The laboratory is also equipped with Scanning and Printing facilities. The laboratory is looked after by a qualified teaching assistant who also provides technical support. Our college library has knowledgeable books. Most of generals of Education Published by N.C.R.T. and other bodies are available. Competitive magazines, books and leading Hindi and English newspapers are also available in the college library. Many Encyclopedias of education and general knowledge and several reference books make library effective in all respects for teacher trainees. 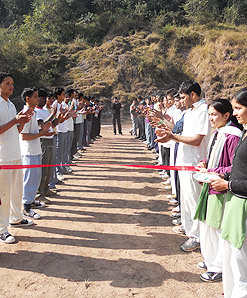 To enhance the physical development of the pupil-teacher we have a spacious play ground surrounded with lush green hills. 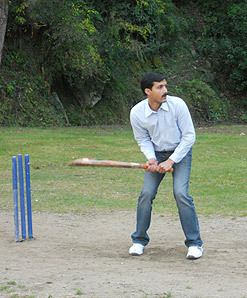 Games like cricket, volley ball, kabbadi and badminton can be played. The college has also a separate sports room having all types of sports material for indoor as well as out door games.